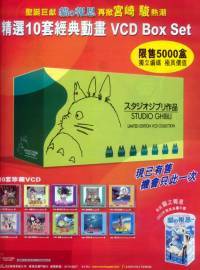 This page contains a listing of Studio Ghibli video set releases in the "Jiburi ga Ippai Korekushon" (Ghibli Complete Collection). No individual films are listed on this page. 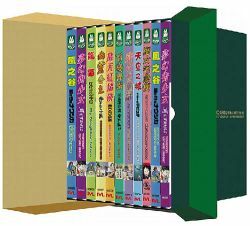 You can order these titles through the anime import stores listed in our Shopping Guide, though some of these titles may be out of print. If you have additional information on any of these titles, information on any titles we missed, or scans of any of the covers, please let us know. Limited to 2,000 sets, a Certificate of Authenticity and postcard set are included. 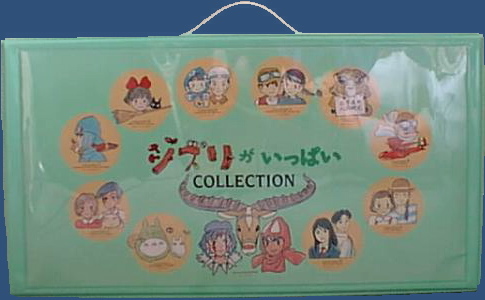 Limited to 5,000 sets, a "Neko no Ongaeshi" 2003 Calendar is included. 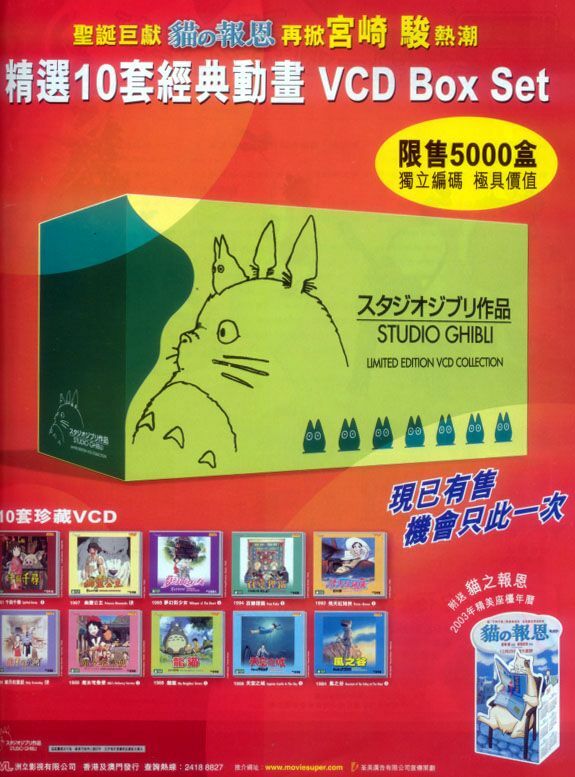 Includes: "Nausicaä", "Laputa", "Totoro", "Grave of the Fireflies", "Kiki", "Only Yesterday", "I Can Hear the Sea", "Porco Rosso", "Pom Poko", "Whisper of the Heart" (AC-3 sound), "On Your Mark" (AC-3 sound), "The Sky-Colored Seed", and "Nandarou". Also includes "Talk: Kurosawa Akira vs. Miyazaki Hayao" (cover pic), "Making of Omohide Poro Poro", and theatrical trailers for all the films. The cover of the box has a metallic-blue line drawing of Mei and is hinged so it can swing open. Each disc is inside a plastic sleeve in its own cardboard sleeve. The cover art of each sleeve is from the 1996 Studio Ghibli calendar. The liner notes contain information and comments from many sources, including a message in Japanese and English from John Lasseter (Pixar). 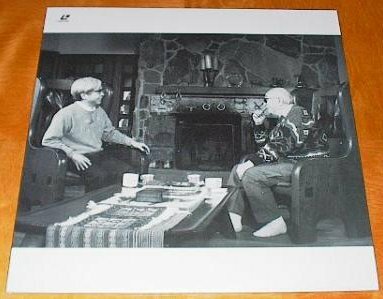 Unlike the liner notes included with the original individual LD releases, these don't contain any of the film credits. CLV, digital stereo (part monaural), 13 discs, 1040 minutes total. All discs are remastered in HDVS, D-2 format. A review of the set. 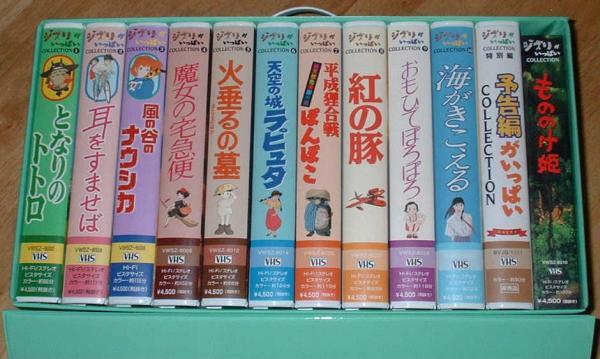 This case was only available to purchasers of all ten numbered "Ghibli ga Ippai" VHS tapes (1-10: Totoro, Whisper, Nausicaä, Kiki, Grave, Laputa, Pon Poko, Porco Rosso, Only Yesterday, and Ocean Waves). Comes with an "omake" video. Image of the case. 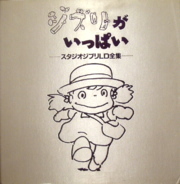 This video was only available to purchasers of all ten numbered "Ghibli ga Ippai" VHS tapes (see list above) who sent off for the VHS video tape case. Do you have this video? Let us know! We'd like a scan of the cover and info on what it contains.